Getting off the Greyhound at Port Authority in NYC after a 4 and half hour bus journey from DC on Saturday afternoon, it felt like no time at all had passed since we started our travels from that very same place weeks previously, when we boarded the bus Toronto bound. With only a few days left in America, and of the best summer of my life, we wanted to make them some of the best days, cramming as much as possible into the short space of time we had in New York. So after getting some food and waiting for the others in our group to arrive (we all got different buses from DC), we said our final emotional goodbyes to Lluis and Jack who were both off to London and beyond the next day, before Shauna, Tasha and I went off in search of our hotel for the night. If you’ve read my hotel reviews, then you’ll know that the hotel we arrived at, after a two hour subway and train journey, was not at all what we had expected. In fact it wasn’t actually a hotel after all, but a motel. A motel that had given our rooms away, leaving us with one room and one kingsize bed between the five of us…fun times. We got out of there as quick as possible the next morning and headed back into the city, to our next hotel which was, thankfully, a much nicer place to be. Up on 103rd and Broadway, the Marrakech Hotel is close enough to the city’s main attractions but far enough away that you can escape the hustle and bustle when you want to. 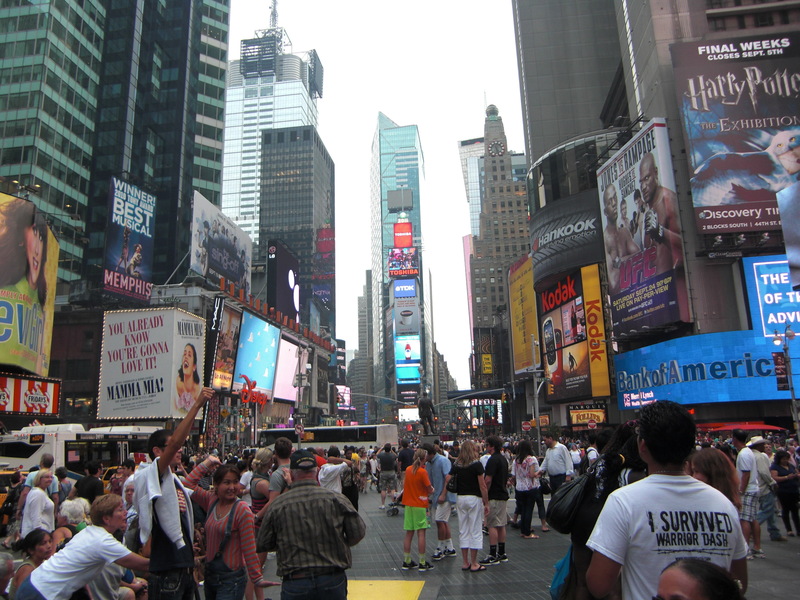 Once we’d settled in and sorted ourselves out, we ventured out to Times Square to meet Rosa and say some more goodbyes as we wouldn’t be seeing her again before returning to the UK. Then it was time for some shopping – or more like window shopping, as our funds were pretty low by this point – and a couple of hours spent in the Apple Store, using their high speed internet…thanks Apple! Next it was time for a game of ‘find Chloe and Mark’, which also involved ‘hunt for the free wifi’, as none of us had working or in-credit phones, so Facebook was our only method of communication! We eventually found each other on the steps at Times Square and all went off for food at Applebee’s restaurant, our last meal together for quite some time. By the time we’d finished eating it was pretty late, so we jumped on the subway going uptown, said our goodbyes (to Mark and Chloe) on the moving train and went back to the hotel, where we found Maisie and Sam surrounded by all their new purchases and ready for a good night’s sleep. Thanks…just changed it again though, as I felt people who don’t know me won’t be able to say it correctly!